Now I have met Amy and I have to say she oozes loveliness and warmth and that is just so right for a home baker don’t you think? The book is an absolute all you need to know about baking. My mum didn’t bake. She just didn’t and I didn’t as a child . I (hang head in shame) make cookies with my kids from packet mixes mostly. I know I have to address this. Amy’s mum, it turns out, made cakes after cake, even one in the shape of ballet shoes. Wow! Amy has been baking since she was a child and has generations of bakers behind her. She clearly knows her stuff. She now has her own successful cake decorating business, Cake Shop Corner. She sells the most yummy cake balls! yep I did say cake balls! The book is divided into sections, which include cupcakes, cakes, cookies, bread, comfort baking and traditional baking. 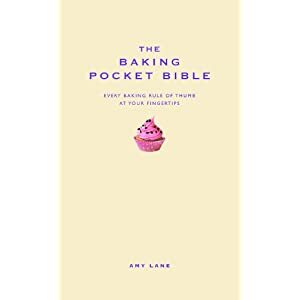 It is also has plenty of helpful baking tips and interesting facts such as ‘bananas are often referred to as growing on trees but are actually the fruit of a herb plant!’ I am shocked! I am going to use this book to learn the basics. It has all the classics; jam rolypoly, flapjacks, syrup sponge pud…its like being back at school or in my grannys warm kitchen. I love this book and can see it being passed down from generation to generation. Fabulous, packed with recipes. Well done Amy! I think you have written a classic. Your book really does seem to be everything you need to know about perfect baking. No more packets for me! Previous Post HUGE 20% discount off TIDY BOOKS products through baby budgeting discount code: One week only!